Today we come full circle in KBH's review of FansProject's G1 Insecticon homage figures with a look at the third and final (presumably) robot bug, Backfiery. The wait has been a bit unsettling, chalk it up to fanboy anticipation (or paranoia), but now we have a chance to fill-in our G1 ranks with a complete team of Insecticon action figures that go great with the rest of our "Classics" TransFormers. So let's swarm ahead and see how Kickback's homage turned out and how he looks posed next to his cronies! Backfiery completes the trio of original Insecticons along with Thundershred and Stormbomb. When I reviewed Stormbomb I predicted I would like Backfiery's robot mode more than his locust mode and while that was indeed an accurate prediction, it turned out I liked his alternate mode more than I though I would. More on that later, for now I'm going to focus on the robot. FansProject really knocked the ball out of the park with Backfiery's robot mode. He's the tallest out of the three (though he only beats Stormbomb by a tiny bit) and the sleekest making him the perfect fit for a ninja robot. Unlike the original G1 Kickback, Backfiery's wings tuck behind his back, running down along his legs. Like the other two Causality figures, Backfiery has very minimal paint applications, everything is molded in the necessary colors. He does have his own symbol tampographed on each of his shoulders in plain white paint, but that's about it aside from his face. Like Thundershred, FansProject has given him a mouth guard instead of the open mouthed G1 character. 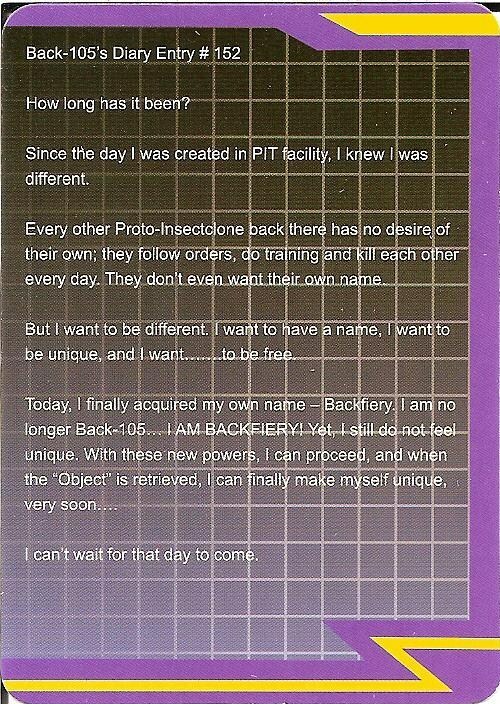 Backfiery, like G1 Kickback, converts into a robotic locust. I call it a locust because "grasshopper" sounds so non-threatening, but "locust" sounds dangerous. Fittingly, Backfiery's locust design is much more effective than Kickback's, which seemed like a box with two legs poking out the back. It seems FansProject based Backfiery's design on the actual insect than the classic toy and that works for me! 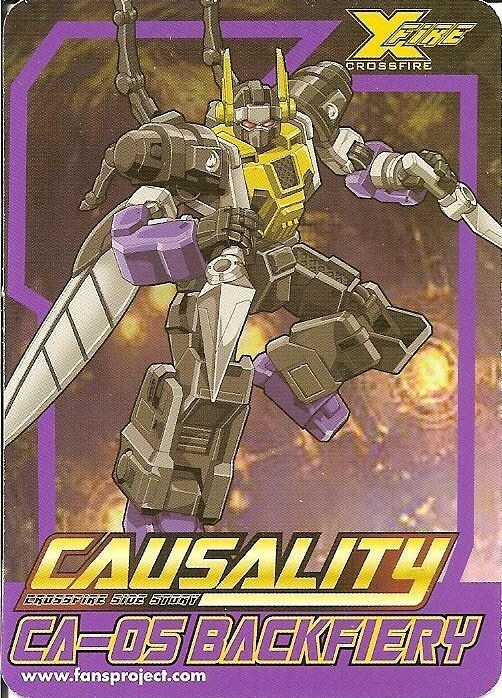 I'm not going to get into Backfiery's conversion process, but I will say it's the most complicated out of the three Insecticons and forced me to consult the instructions each time I try changing him into the locust mode. Some people pride themselves on transforming these figures without instructions, but I lean towards the "review the manual until you get it locked in" crowd. Backfiery's weapon(s) of choice is the ninja's shuriken, specifically, throwing daggers. BF has six of them and all are storable on both his locust and robot modes via pegs on each of the legs (lower legs: robot, hind legs: locust). The six blades are identical and have a hole in the center, just above the handles where the pegs fit. Take special note: THESE THINGS ARE SHARP! They are molded to a very sharp point and can easily penetrate your skin if you're not careful. It definitely forces you to pay attention when you're handling the figure. With Backfiery's slimmer form you're able to get him into more ninja-like poses, but he has the same amount of articulation as the other two figures. Since his legs and torso aren't as bulky, it seems like he's more flexible. The locust mode's articulation is similar to the other bug modes, but his forward legs are a bit flimsy. A grasshopper's thorax is usually close to the ground, anyway. The hind legs are made of the robot's lower legs and feature plenty of movements, tapering off at the "toes." And finally we have the Insecticons! Updated and perfectly integratable into your "Classics" collection. The quality is awesome, but price is obviously the major determining factor in whether or not you want to buy these. I snagged mine from Big Bad Toy Store where I preordered him for $47.99, the same price I paid for each of the others. However, all three figures are currently listed for $51.99 at BBTS and other online retailers. That's only a four dollar increase per figure, but if you're thinking of buying these guys, I suggest you do it before they get another price increase, or sell out. So far Thundershred's the only Insecticon with a Repro Labels upgrade, but Stormbomb's is available now and Backfiery's can't be far behind. Once I've upgraded all three of them you can expect a new post showcasing all three in their full G1 glory!